Summer is the perfect time for an ice-cold glass of mouth-puckering lemonade. Over the weekend, I made a batch and added ginger. Ginger is an anti-inflammatory. Some of its health benefits include helping with nausea, upset stomach and joint and muscle pain. This staple of many Asian cuisines adds a peppery note to the lemony sting in this lemonade. 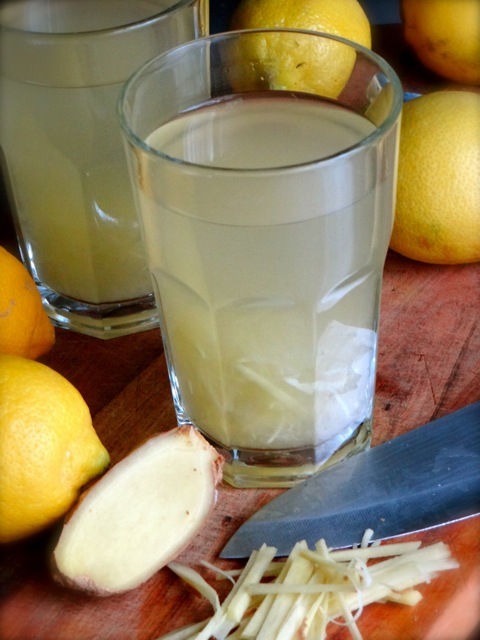 At the end of each glass, there is a small honey and lemon soaked pile of raw ginger to be enjoyed. I always feel that I’m doing something amazing for my body when chewing on the steeped, matchstick-shaped ginger pieces. I also decided to sweeten my latest batch with honey as opposed to sugar. From a caloric aspect, honey contains more calories than processed white sugar. Per teaspoon sugar contains about 16 calories, whereas honey contains around 22 calories. Initially, I was shocked to have read that but it all made sense when I read on and found that per 100 grams, sugar contains about 387 calories as opposed to the 300 calories per 100 grams of honey. The density of honey versus processed white sugar explains this difference. However, calorie counting should not be the only measure for which used in deciding what to eat. Honey contains trace amounts of vitamins while sugar doesn’t contain any. Honey also contains more trace amounts of minerals than sugar. And although the vitamins and minerals in honey are only trace amounts, my thoughts are that if you’re eating a Western diet, which generally consist of lots of processed foods, loads of fats, and generally very little fresh fruits and vegetables you’d better seek out foods that will maximize your intake of vitamins and minerals, even if the difference is only in trace amounts. That being said, honey would be the clear choice over processed sugar. The caveat in consuming honey and reaping its benefits is to ensure that the honey is left in raw form. Heating honey will destroy its beneficial properties. For this recipe, I found that the lemon juice will dissolve the honey without heat. Lemons are also packed with vitamin C and flavonoids that fight infections. And though lemons are acidic, once ingested, they can help alkalinize our bodies and restore balance to our pH levels. My general rule for making lemonade is one cup of water and a tablespoon or so of honey per lemon. So with that, you can make as much or as little lemonade as you wish. Here’s to our health! Prost! Start by loosening the juice from the pulp of your lemons by rolling them beneath the heal of your hand. Slice the lemons in half and juice them using a fine-mesh strainer and citrus juicer. Add the juice to a glass pitcher. You can choose to add the pulp to the pitcher if you like, but discard the seeds. I used the pulp in my lemonade. 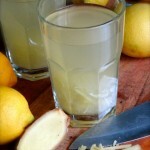 Add the honey to the lemon juice, and stir to dissolve the honey, in which the acidity of the lemons will facilitate. Next, peel the ginger using the front of a metal spoon. Then julienne the ginger, and add the matchstick like pieces to the pitcher. Add the water and stir. Add more honey if necessary, then refrigerate until cold. Serve cold. Peel the ginger using the front of a metal spoon. Julienne the ginger into thin, matchstick-like pieces.